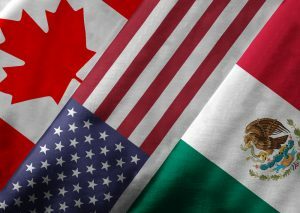 It was announced on Sept. 30 that the United States, Mexico and Canada reached a new deal to replace the North American Free Trade Agreement (NAFTA). The deal will be called the United States-Mexico-Canada Agreement (USMCA). NAFTA was a trade agreement between the United States, Canada and Mexico that was made in 1994 under the Clinton administration. The idea for NAFTA began in the 1980s under President Reagan. President Trump expressed his disdain for NAFTA since his campaign trail. After being elected, he aimed to eliminate the deal. However, he decided to renegotiate it instead. Renegotiation talks began in August 2017. Now, more than a year later, the USMCA has been revealed. This USMCA brings several new provisions to the automobile and steel industries. As for agriculture, the biggest change is in the dairy industry. According to a report from The Washington Post, Canada will open its dairy market to U.S. producers. Canada’s dairy industry is a complex one. Certain policies have been set to ensure that Canadian dairy producers do not go bankrupt. The policies include a high tariff on U.S. dairy products. In the USMCA, Canada will keep its complex dairy system, but the market share will be wider for U.S. products. Chapter 19 of the original NAFTA has been incorporated into the USMCA and will stay the same. This chapter allows each country to challenge one another’s anti-dumping and countervailing duties in front of representatives from each country. Although an agreement has been made, it does not include provisions to protect southeastern specialty crop growers from unfair Mexican trade practices. Due to the lower price of produce coming from Mexico, and the lower costs of production, American growers in the Southeast are finding it nearly impossible to keep up with such steep competition. Since USMCA does not include provisions that protect American specialty crop producers, Senators Bill Nelson and Marco Rubio have introduced a bill that addresses this issue and aims to protect these growers. Read more about the legislation here. USMCA must be approved by Congress and the legislatures in Mexico and Canada. So, it could still be months until the new agreement takes effect.